Learn to climb or push through the grades at The City of Rocks, Idaho. This world-class climbing destination offers technical face, slab, and crack climbing, and we make the most of it with this 4-day all-inclusive women’s rock climbing program. Learn to climb or refreshen old skills in low ratio group from highly experienced female AMGA Certified Guides. No high heels, but fun, sweat, and smiles are on tap at the City of Rocks, Idaho. The City has hundreds of climbing routes from easy to beyond expert nestled in the high desert mountains and pine trees of southern Idaho. It’s the perfect training ground to learn to climb for the first time and for seasoned climbers alike. If you’re looking for top-notch instruction on your climbing technique, learn more about building anchors, using traditional protection and performing self-rescue, then look no further than Chick’s women rock climbing program. Stay for the multi-pitch day if you like getting off the deck and climbing a long route. We’ll spend 3 full days climbing and working on skills at various areas within the City of Rocks and Castle Rocks State Park, located just outside of Almo, ID. In true Chicks style, small climbing teams will be formed according to skill level to maximize your time on the rock and the practice of new skills. Both sport and traditional routes abound, giving us a wide variety of climbing styles to work on. We will focus on giving you the tools to improve your climbing and become a more self-sufficient and well-rounded climber. This Chick’s women’s rock climbing program includes all group climbing gear (ropes & technical equipment) in addition to an array of demo gear for you to test out. You will also receive a welcome bag full of gifts from Chicks Sponsors. We will start and finish our days together at our campsite right among the climbing formations. We will all be camping together, and all your breakfasts and dinners will be prepared for you. Find out what the City is all about. Join other like-minded adventurous Chicks for our women’s rock climbing program, and prepare to be pushed and inspired by a fun and supportive group of peers. The Chicks experience is a special one, and this program will be no exception. Camaraderie around the campfire in this remote and beautiful high desert terrain only adds to the charm of the City, letting you go unplugged for a few days. The City of Rocks is about a 4-hour drive from Jackson, WY or from Salt Lake City, UT. Reno, NV is also a good starting point within driving range. 4:00 pm: Opening meeting / Orientation at the campground. Group dinner and demo gear handed out. 7:00 – 7:30 am: Group breakfast at the campsite. 8:00 am – 4:00 pm: Climbing at the City of Rocks. Bring your own lunch. 8:00 am: – 4:00 pm: Climbing at the City of Rocks. Bring your own lunch. 8:00 am – 4:30 pm: Climbing at Castle Rocks State Park. Bring your own lunch. 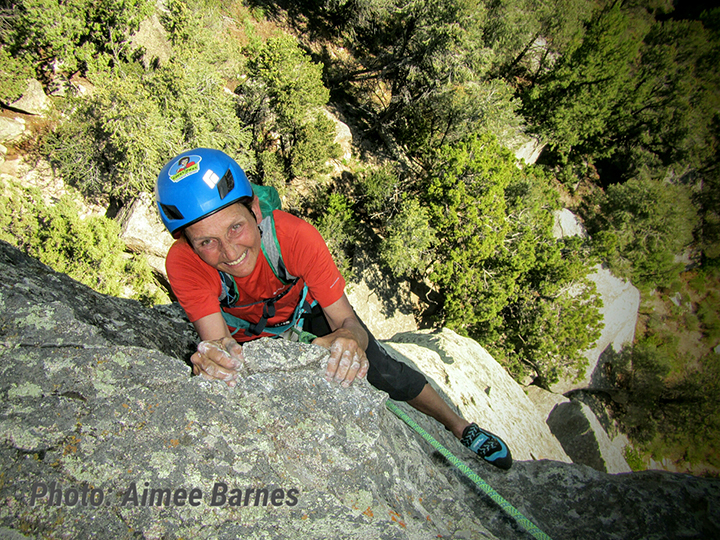 8:00 am – 4:30 pm: Climb a multi-pitch route in Castle Rock State Park, 2:1 ratio. Bring your own lunch.